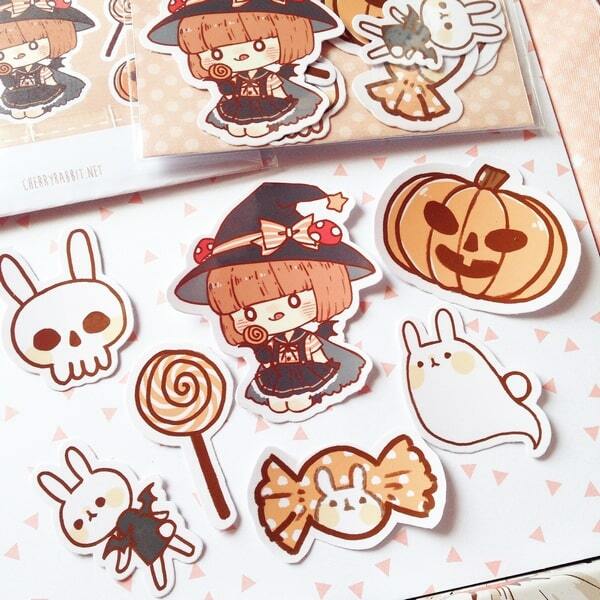 If you are looking for cute Halloween pins to wear, or even cool Halloween stickers to put on your phone, laptop and notebook, read this selection on the cutest, kawaii, Halloween stickers created by talented artists. 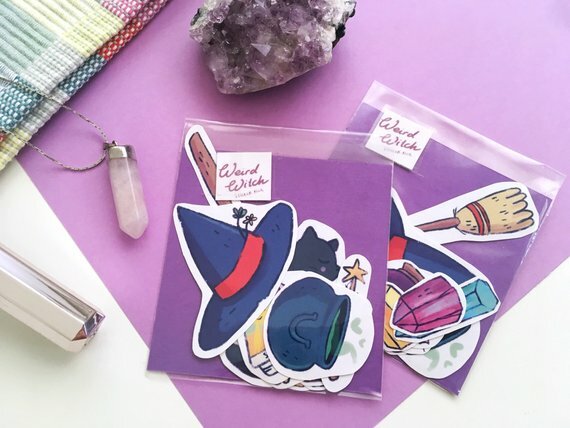 You will find Anime and Manga inspired Halloween stickers and enamel pins featuring Magic, Witches, Pumpkins, Vampires, Cats, cute Ghosts, bats and other cute animals. 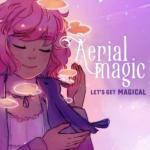 Sai aka LOVESOUP is a Freelance Illustrator and Graphic Designer. Sai left Sydney, Australia to work on a holiday visa in Tokyo, Japan, from where she shares experiences and photos. 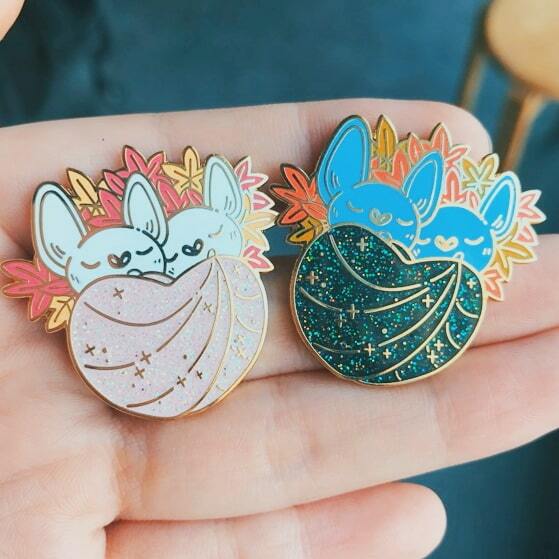 Sai is working on developing her LoveSoup brand by designing unique pins, stickers, watercolor illustrations, and is planning to add in the future other types of merchandise such as pouches, tote bags and shirts. Support Sai’s Japan adventure on Patreon, and follow Lovesoup on Twitter, Facebook and Instagram. 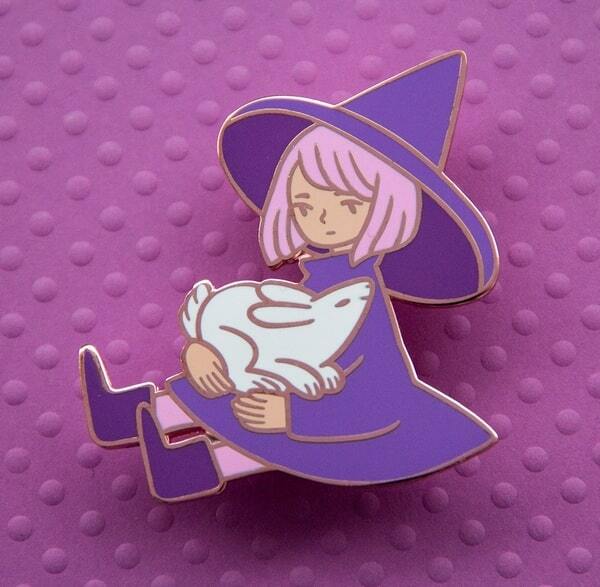 Be sure to check out LoveSoup’s enamel pins and stickers online on Etsy, Tictail and LoveSoup’s online shop. Cherry Rabbit is an artist and Illustrator based in Melbourne, Australia, that we adore. 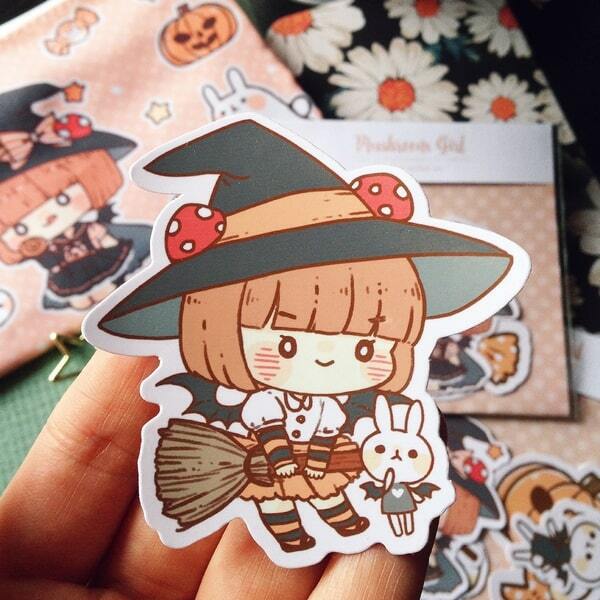 With such cute watercolor illustrations and drawings of dreamy girls, witches and kawaii rabbits, you will also fall in love with her art. 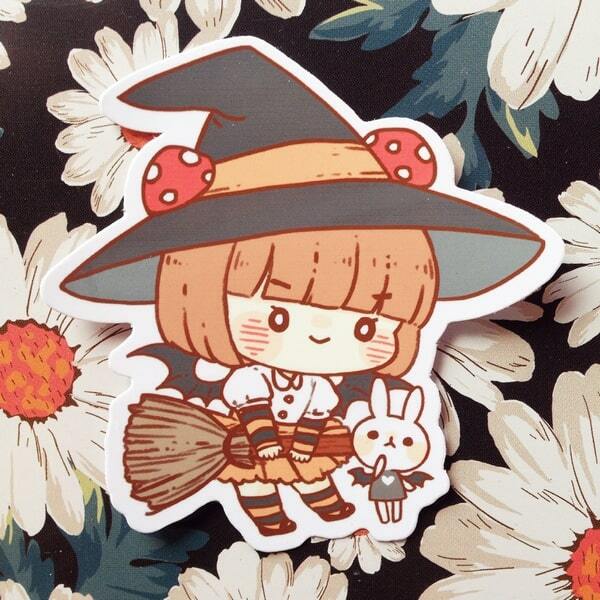 Check out Cherry Rabbit’s kawaii Halloween stickers with witches and add them to your Halloween sticker collection. 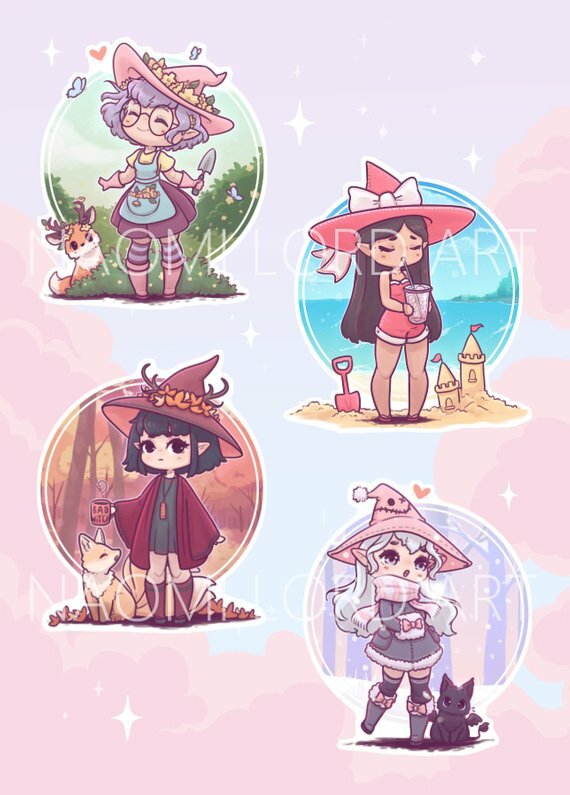 Vickisigh (Victoria Tsai) is an artist from California USA that draws modern witches, princesses and mermaids, capturing the happiness of everyday life. 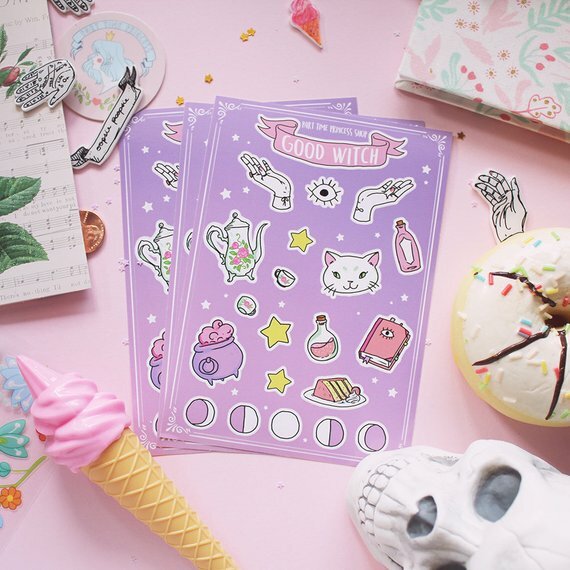 You can brighten your day by displaying Vickishgs’ cute illustrations in your home work space, and add enchanting stickers to your Halloween day planner. Specialized in all things cute, Naomi Lord is a Freelance Illustrator from South East, England. 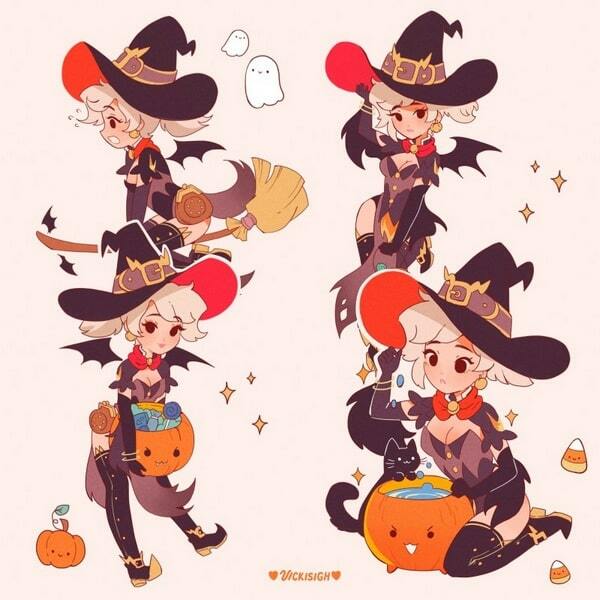 Check out her anime inspired, kawaii art on Instagram, Facebook, Etsy and apply these cute chibi characters on your Hallowen witches journal. You can support her art on ko-fi. Russian artist Irudisu (Alexandra Mayorova) draws witches and illustrations in pastel colors. 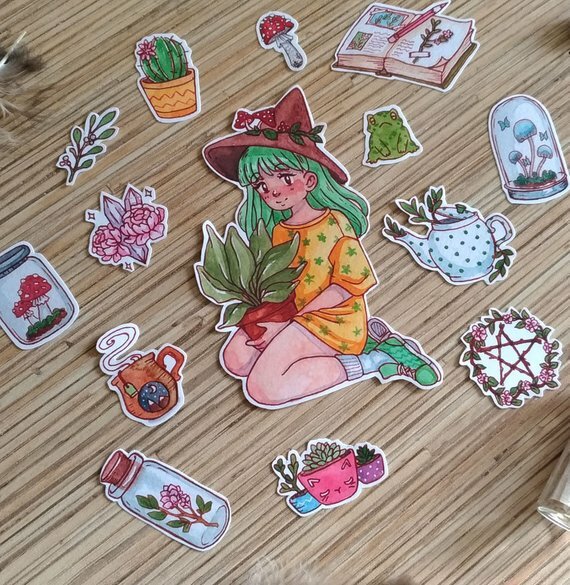 Visit her Etsy store IrudisuArt for postcards, prints, stickers with cute witches. Feefal, a Sweedesh illustrator, makes watercolor and ink illustrations that have darker themes like skulls and outer space. If you are a beginner artist looking to draw the human bone structure, you will find plenty inspiration from Feefal’s drawings on Instagram. 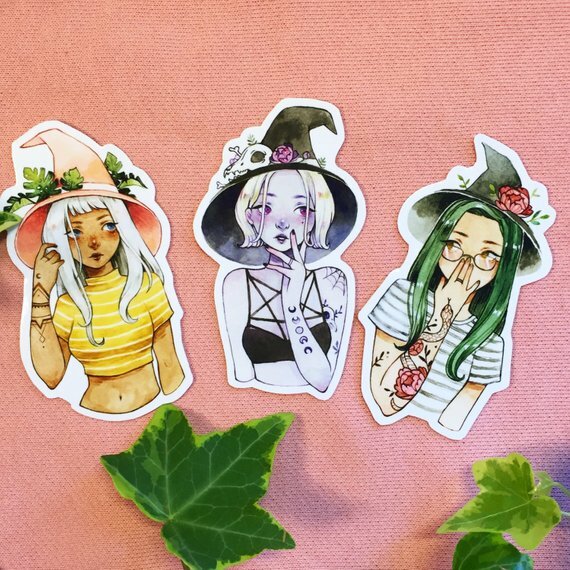 These cute witches with a supernatural look are the perfect stickers for a Halloween art journal. CocoGlez is a friendly illustrator that loves to spend time with cats, plants and her deer Ciervi, that she is inspired to draw. 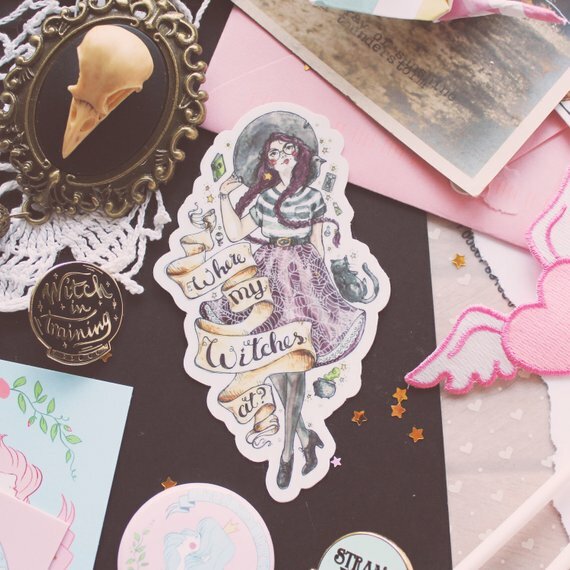 Get CocoGlez Wierd Witch stickers on your planner and get in the mood for Halloween. You’ll be happy to know, that The Grumpy Unicorn is a shop run by a mother (Anna-Marie) and her son (Fynn). 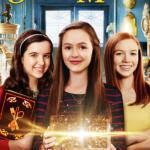 They design together the merchandise and Fynn illustrates them. 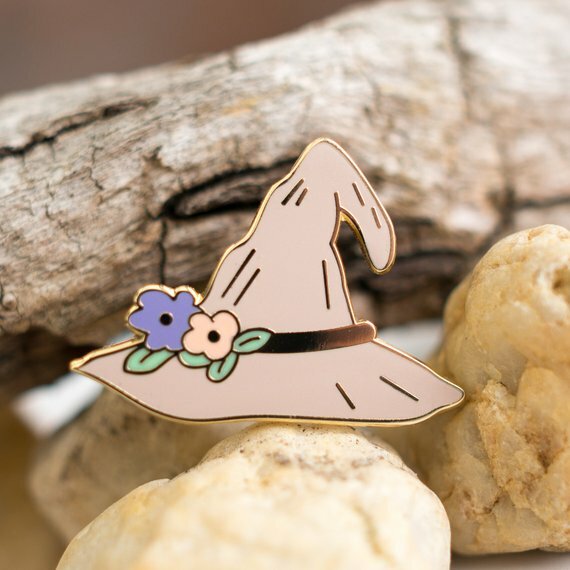 They offer a wide array of cute pins to choose from. 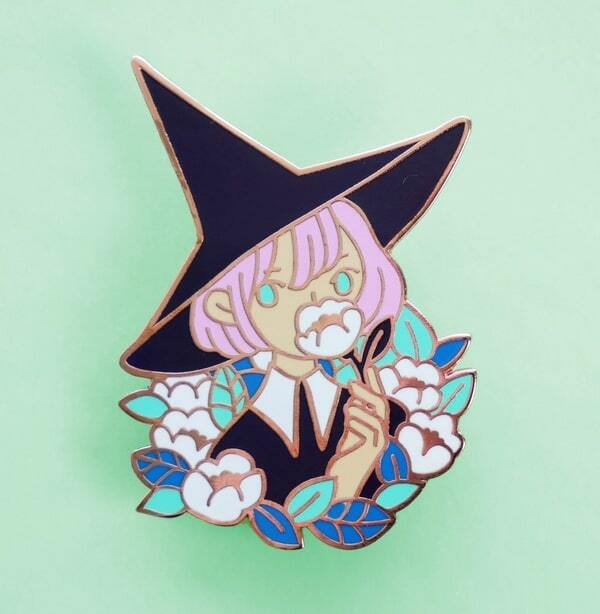 You can also wear this enamel pin discretely on your blouse, preparing for Halloween. Maria Abagnale is an Italian artist, that after a health issue started expressing her emotions through art. 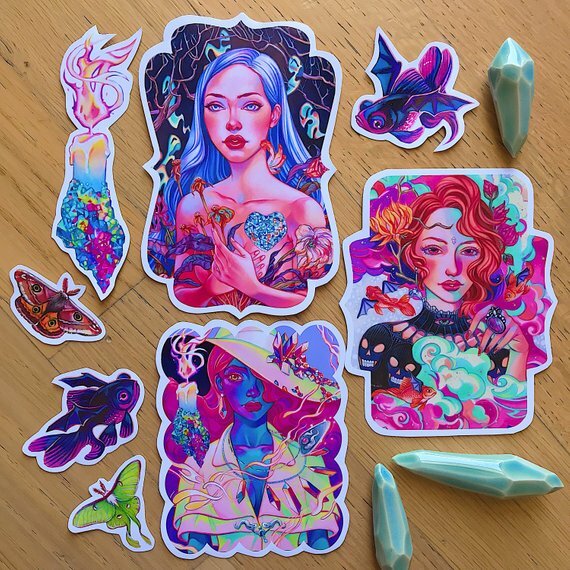 Feeling underwater, she illustrates a colorful world of pop surrealism, full of mermaids. 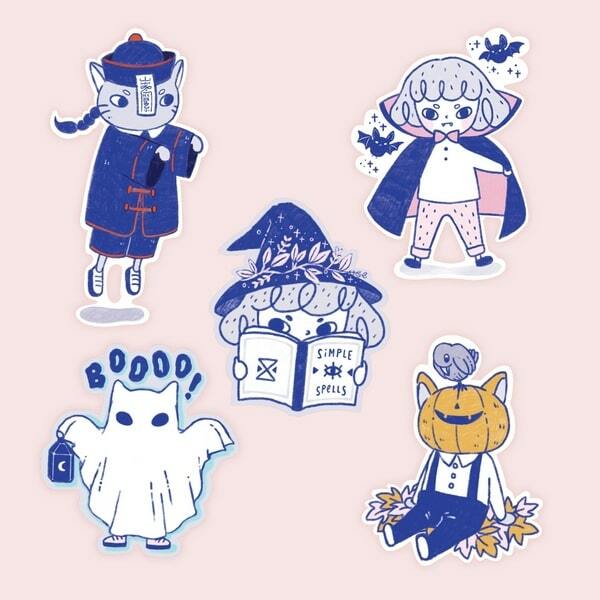 Maria’s Halloween stickers look outstanding. Illustrator Daphne Blohland from Rotterdam, Netherlands makes videos on Youtube where she shows her drawing process. 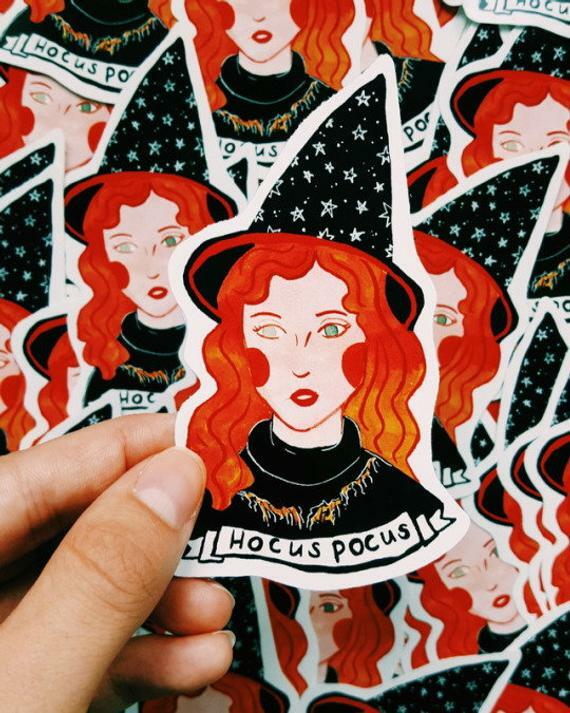 Add some creative magic in your life with this “Hocus Pocus” witch sticker. 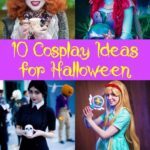 Pin This you liked the article selection.